I'm writing this in Wellington, and we've had a lovely relaxing day here today, but the big thrill really was the journey here. We had the ride of our lives on the Overlander yesterday, an epic 12 hour train ride from Auckland to Wellington along the mountainous spine of the North Island. We travelled with Rob and his colleague Mia (from Lebanon) and her boyfriend Rick, who is a Kiwi and his mum who is Aussie. We left Auckland at 7.25am, the train sauntering along in no hurry at all, with a very friendly Maori guard giving us a gently meandering commentary about the landscape we were passing and the history of various important Maori sites along the way. It was all very relaxing and gentle. The landscape was stunningly green and rich, and very volcanic in its shapes and the rippled grassy slopes.When the train starting climbing into the volcanic mountainous ranges of the North Island, the scenery got very dramatic and stark, but the vegetation up to the tree line was still so lush and dense - at one point I saw palm trees and yucca-like shrubs within about 100 ft of the snow line. The train has an observation car at the end with a picture window, and an outdoor deck behind the engine, which was great, but I couldn't get many good photos due to the rickety motion of the train. The train makes a longish stop at the Tongariro National Park and we got out and looked around. It was quite startlng to breathe in the alpine air. There was a spectacular view of the perfect snow-covered cone of Mt Ngaurahoe, which I'm told played the part of Mount Doom in Lord of the Rings. Later from the train we had a great view of the multi-peaked snow-covered Mt Ruapeha, the highest mountain on the North Island at 2729m. Much further on, we passed some dramatic ravines with a jewel-like green river running through them. The guard told us of the amazing engineering feats in the building of the viaducts and getting the track to circle the mountains and 'loop the loop' in order to cope with the sudden elevation of the land. As we arrived in Wellington in the dark, we had a great walk along the lit-up harbour and then down the bustling and bohemian-feeling Cuba Street to get to our hotel. 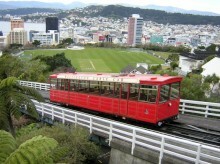 My first impression of Welly (yes - in NZ everything is abbreviated!) was that it's full of pubs and really lively. Lots of English and Irish pubs - actually it feels like a European city, like Dublin or maybe even Cardiff. Very different from Auckland, which feels totally un-European and is a massive urban sprawl. 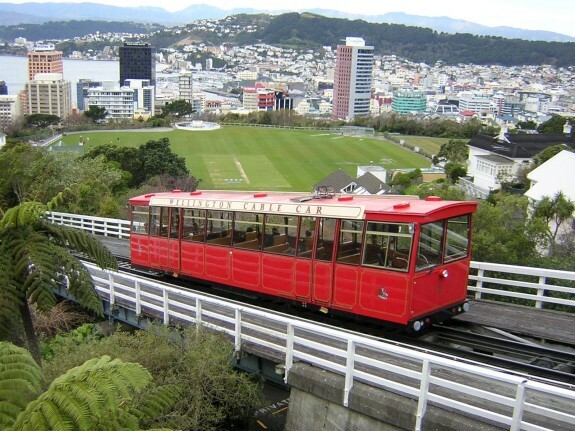 Wellington is quite compact, set in steep hills around a horshoe shaped harbour - very pretty.